Constant current AC drive operated out feed system synchronized with AC variable frequency speed drive. Specially designed gear boxes are fitted on each station. Heavy duty base frame, covered with aluminium checkered plate. Minimum wastage level and minimum dependency on labour due to increased automation. 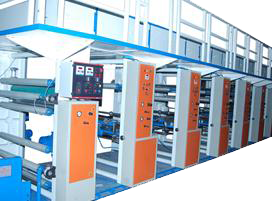 SSMECH Rotogravure Printing Machine is designed and developed to achieve high standards in flexible printing. It's state-of-the art technology offers freedom to carry out even difficult jobs. The Roto Printing Machine with reverse printing attachment drying chamber, heaters with blower system roll to roll winding–unwinding stations, main motor AC with variable frequency speed drive control, clutch and brake, complete with all standard accessories and electricals as detailed in specifications. HM, HDPE, LLDPE, Polyproplene, PVC, Polyester film, Foam, Cellophone, Foils, Plastic and Papers.